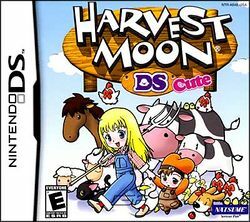 Harvest Moon DS Cute is the female version of Harvest Moon DS. Players may choose to play as either Pony from Harvest Moon: Another Wonderful Life or Claire from Harvest Moon: More Friends of Mineral Town. Harvest Moon DS Cute is different than Harvest Moon DS. In this version of the game, the player's mother sends a wish to the Harvest Goddess that you may be a successful farmer. The Harvest Goddess eventually determines the player has no work ethic, and tells the Harvest King what she thinks. The Harvest King angrily tells the Harvest Goddess she isn't trying hard enough, and she is slacking off in her old age. The Harvest Goddess then calls the Harvest King a "big baldy", and is turned into stone. The Harvest Sprites defend the Harvest Goddess, which angers the Harvest King even more, and he sends the Harvest Sprites and the Harvest Goddess to another world as punishment. He then writes a letter to the player telling her if she works hard, he will return the Harvest Sprites and the Harvest Goddess. This page was last edited on 27 October 2015, at 02:36.